Located on the historic grounds of the iconic Schmidt Brewery, Keg and Case West 7th Market is a culinary and retail marketplace. 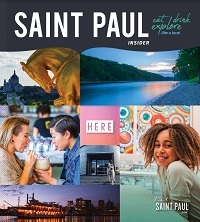 As the birthplace of intercollegiate basketball, Saint Paul holds a very unique tie to the NCAA Final Four. Bounce across the river and double up on the fun at these eight Capital City spots. Celebrate Valentine's Day with your sweetie in Saint Paul.